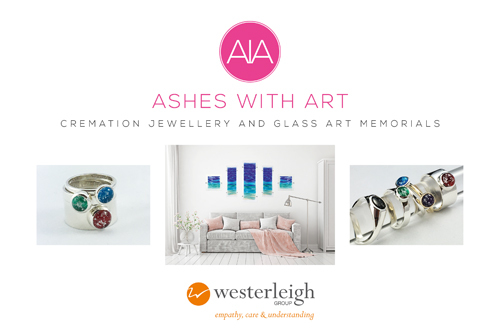 In partnership with "Ashes With Art", we offer beautiful cremation jewellery which can be made in solid silver, 9ct and 18ct gold, rose and white gold. Every item is expertly made by hand making each of the cremation tributes both unique and holding a special beauty that is only created through Ashes With Art. 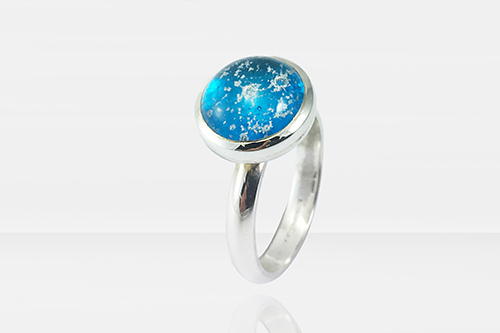 All of the Jewellery we offer comes with complimentary engraving, up to 30 characters. 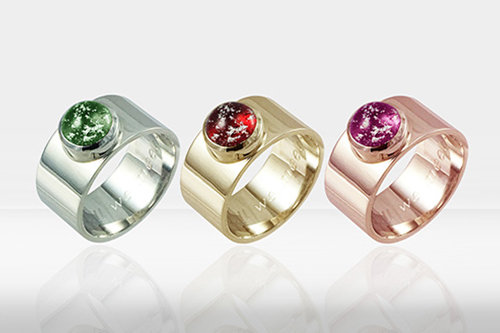 You can also choose from 8 colours of glass gemstone. 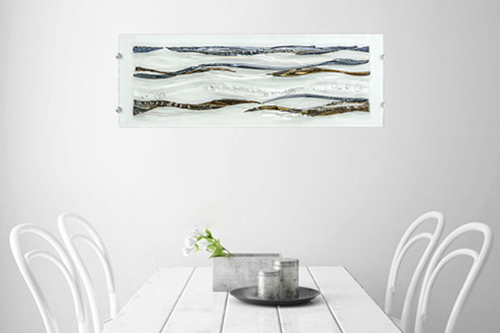 Our glass art memorials come in a variety of styles and sizes. 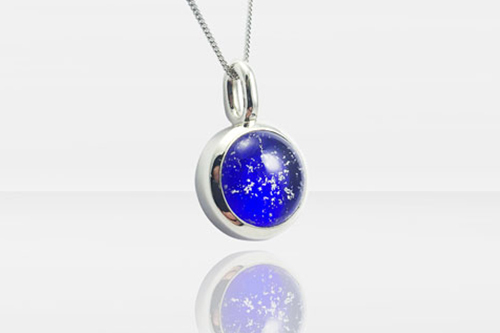 In memory of your loved one, a small amount of cremation ashes are fused into specialist glass for your memorial jewellery or cremation glass art. This captures their essence and spirit, allowing you to keep your loved one close forever in your home or with you, wherever you go. For further information on any of the items below, please contact our Crematorium Office. 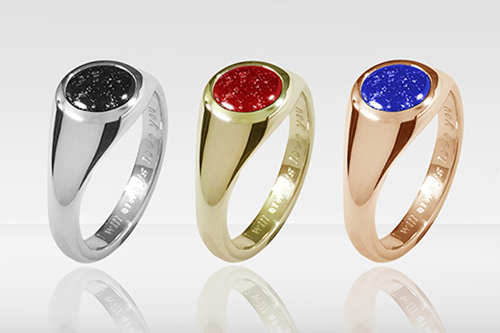 The Signet Ring - Our Signet ring is a beautiful design with contemporary lines and a stunning flat gemstone, a classic tribute for your loved one. The Millennium Glass Art Memorial reflects the fluidity of life and is a timeless and completely unique tribute to your loved one. A stunning memorial suitable for the home. 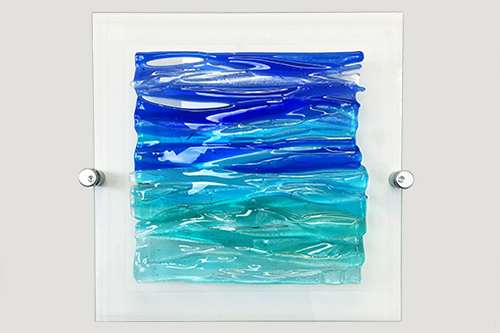 The Seascape Glass Art Memorial reflects the movement of our oceans. 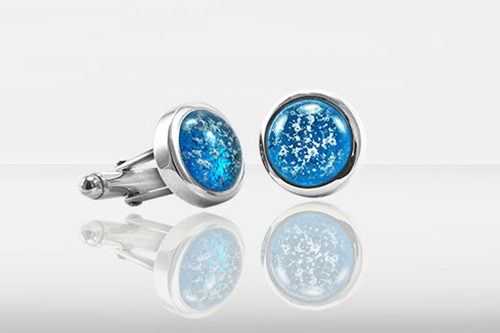 It is beautifully made and a perfect tribute for those that love water and the sea. Cherished forever - The Cherish Ring is a perfectly formed reminder of your loved one, keeping you connected at all times. Forever with you - The Forever Ring is a fitting tribute to your loved one, ensuring a continued closeness to your loved one. 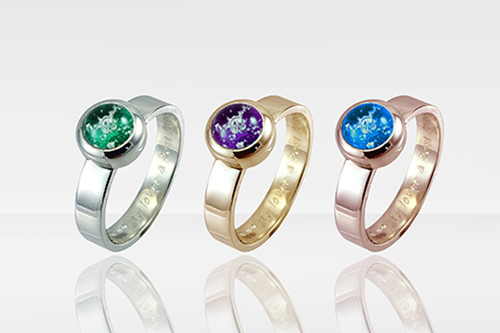 For eternity - The Eternal Ring is beautifully made and keeps the eternal bond you share with your loved one always with you. 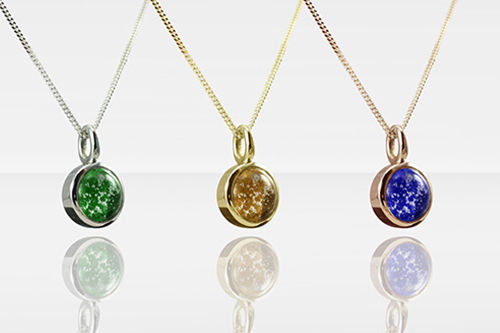 Their essence lives on - The Essence Pendant keeps the essence of your loved one forever next to your heart. This piece comes ready to wear with an 18" necklace. 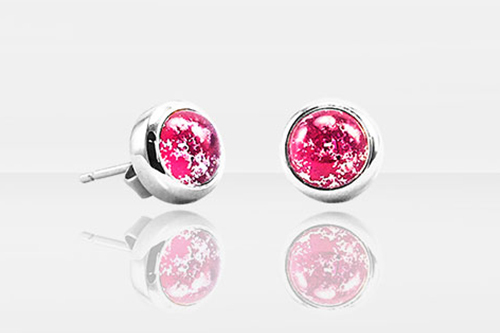 Always together, always and forever - The Always Charm is a perfect expression of love for special occasions. 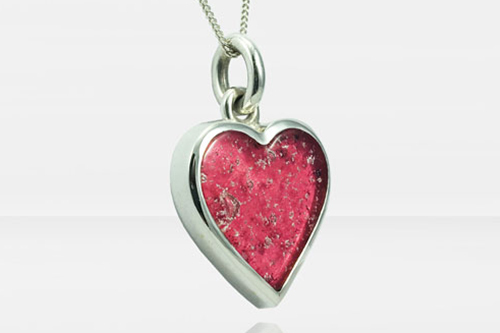 Stunning and unique - Our Heart Pendant is the most beautiful and exquisite celebration of love. This piece comes ready to wear with an 18" necklace. 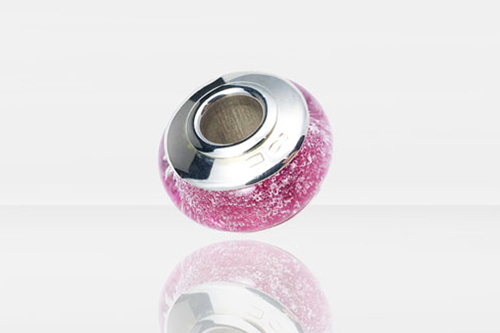 Our exquisite Charm Bead - Luxuriously finished like no other bead on the market, our Charm Bead is a wonderful addition to any charm bracelet. 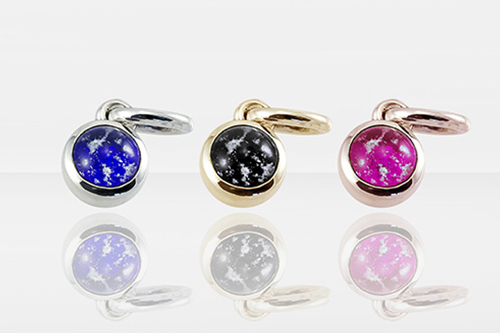 Our Classic Cufflinks, beautifully designed and made - Whether worn everyday or kept for special occasions, these beautiful pieces will be held dear and bring warm memories. The most beautiful stud earrings - A classic and timeless design allowing you to remain close to your loved one, to wear on their own or to match with a ring or pendant. Devoted to each other - The Devotion Pendant is the big sister of The Essence Pendant and your personal tribute of the bond you share with your loved one that is everlasting. Our big, bold and dramatic cocktail style ring. 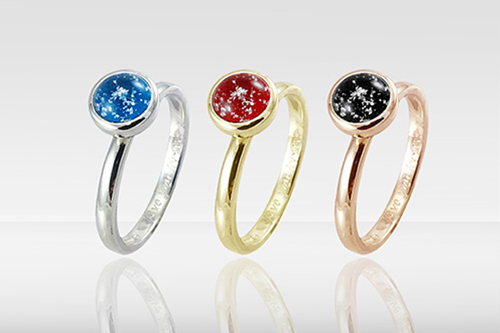 The impressive Passion Ring is the ultimate in memorial rings and a real statement piece to treasure forever. Click the image above to download a .pdf copy of our brochure.